Monday – 16th July 1924: Crowds of photographers, reporters and ‘autograph seekers’ greet the pilots of the first (successful) round-the-world flight as it landed at Croydon airport for its London stopover. Tuesday – 17th July 1974: A bomb explodes in a tourist-packed room of the Tower of London, killing one person and injuring 41 others. No-one claims responsibility for the bombing, and no culprits are found. Wednesday – 18th July 1922: IRA gunmen Reginald Dunne and Joseph O’Sullivan are sentenced to death at the Old Bailey for the murder of Sir Henry Wilson, who was shot in the back nine times one month earlier. Thursday – 19th July 1932: The current Lambeth Bridge is opened by George V, replacing an earlier suspension bridge that was awkward to use and in a state of disrepair. Friday – 20th July 1982: IRA nail bombs explode in Hyde Park and Regents Park, resulting in the death of 11 people and injury to 50 more. 7 horses from the Household Cavalry also die as a result of the attacks. 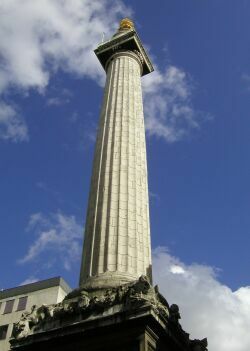 Its full name is The Monument to the Fire of London. That gives you a bit of a clue to its origins. Its height, at 202 feet, is also the exact distance between its base and the site of Thomas Farryner’s bakery on Pudding Lane, where the great fire began in 1666. It is generally claimed to be the tallest freestanding stone column in the world. It was designed by Christopher Wren and Robert Hooke, and constructed between 1671 and 1677. For a fee of £2 (£1 for kids) you can climb the 311 steps of a spiral staircase housed within the column to reach the viewing platform at the top. The Monument was also designed to serve a scientific purpose, featuring an underground laboratory, a central shaft to be used as a zenith telescope, and each step on the staircase being precisely 6 inches tall – allowing experiments on barometric pressure to be conducted. Picture taken from DennisSylvesterHurd’s Flickr photostream under the Creative Commons Attribution-NonCommercial-ShareAlike 2.0 license.